1. The metaphors, which Murakami said actually don’t have meanings, they’re just there to make you think. 2. It is the first from him that I read, and it made me fall in love with him instantly. 3. It is also the novel that I wrote a report about in my Fiction subject back in college. 4. Murakami’s thoughts about things in this book are great! Sometimes fate is like a sandstorm that keeps changing directions. You change direction but the sandstorm chases you. You turn again, but the storm adjusts. Over and over you play this out, like some ominous dance with death just before dawn. Why? Because this storm isn’t something that blew in from far away, something that has nothing to do with you. This storm is you. Something inside of you. So all you can do is give in to it, step right inside the storm, closing your eyes and plugging up your ears so the sand doesn’t get in, walk through it, step by step. There’s no sun there, no moon, no direction, no sense of time. Just fine white sand swirling up into the sky like pulverized bones. That’s the kind of sandstorm you should imagine. … Closing your eyes isn’t going to change anything. Nothing’s going to disappear just because you can’t see what’s going on. In fact, things will be even worse the next time you open your eyes. Only a coward closes his eyes. Closing your eyes and plugging up your ears won’t make time stand still. … Whatever it is you’re seeking won’t come in the form you’re expecting. 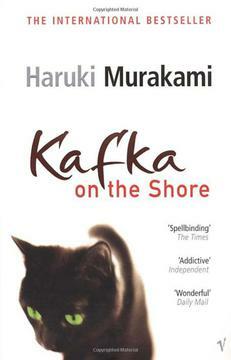 Kafka, in everybody’s life there’s a point of no return. And in a very few cases, a point where you can’t go forward anymore. And when we reach that point, all we can do is quietly accept the fact. That’s how we survive. Things change everyday, Mr. Nakata. With each new dawn it’s not the same world as the day before. And you’re not the same person you were, either. … But I think where a person is born and dies is very important. You can’t choose where you’re born, but where you die you can—to some degree. … The more you think about illusions, the more they’ll swell up and take on the form. And no longer be an illusion. Listen up—there’s no war that will end all wars. War breeds war. Lapping up the blood shed by violence, feeding on wounded flesh. War is a perfect, self-contained being. You need to know that. You have to overcome the fear and anger inside you. Let the bright light shine in and melt the coldness in your heart. That’s what being tough is all about. Cops are just gangsters who get paid by the state. Everyone of us is losing something precious to us. Lost opportunities, lost possibilities, feelings we can never get back again. That’s part of what it means to be alive. But inside our heads—at least that’s where I imagine it—there’s a little room where we store those memories. A room like the stacks in this library. And to understand the workings of our own heart we have to keep on making new reference cards. We have to dust things off every once in a while, let in fresh air, change the water in the flower vases. In other words, you’ll live forever in your own little private library. … But things in the past are like a plate that’s shattered to pieces. You can never put it back together like it was, right?